"Supply Chain Management: Death of the Salesman"
Has the wholesale distribution segment of the supply chain become an unnecessary step in the sales process with the constant advances in marketing technology and the rapid growth of consumer self-service sales? 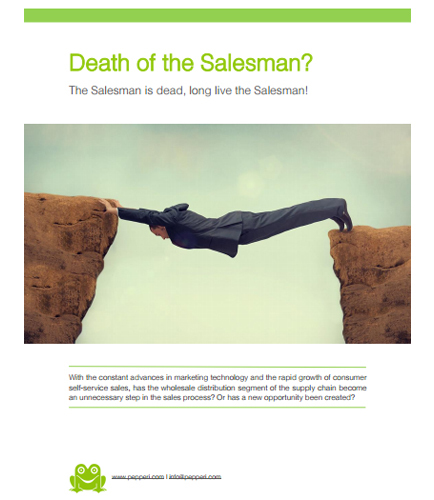 Or has a new opportunity been created?Is the salesman dead or just evolving? Expanding to wholesale and retail distribution, makes it possible to verify the quality of products and processes and creating new operating methods, and simultaneously cut times to market and costs. Death of the Salesman:What does it cover? This whitepaper talks about the wholesale distribution system of the supply chain as a dispensable process or not. What's the cause of death for the B2B salesperson in the highly transactional world of wholesale and distribution? Are wholesalers/distributors doomed to be a thing of the past? Are wholesalers destined to be absorbed by their suppliers? How is it that the wholesale and retail distribution segment of the supply chain has become an antiquated business model in terms of client relationship management? How wholesale distributors can grow through a shift in their business models?